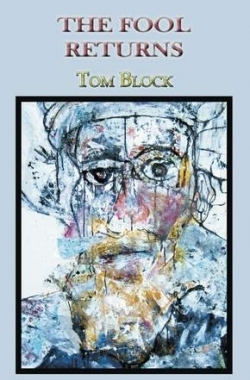 Tom Block has expanded his hat-trick of accomplishment in the arts. The 51-year-old Silver Spring writer, playwright and visual artist, a Montgomery County native who has produced impressive work in all three venues, recently branched out from nonfiction to a novel. “The Fool Returns” is his fifth published book. The earlier book, Block said, “explored the specific historical interactions between these two religions.” Surprised at “how little is known about this positive relationship,” which he attributes to politics, Block’s goal has been “to find as many ways as possible to get the story into the public domain. The novel is one more manner of talking about it in a creative way.” He also has addressed the subject by writing articles and giving talks in Cairo, Istanbul, Barcelona, as well as the U.S. and Canada. The established dramatist chose to use the novel form rather than a play. Not only was he not writing plays when he first drafted the novel, but also, Block said, “There is way too much information that I wanted to include for it to be a play.” He acknowledged, however, that a screenwriter who wanted to option the work would be welcome. As the son of a journalist and an English professor, Block’s writing talent is no surprise. He grew up in Bethesda, graduated from Georgetown Day High School and Vassar College, and wrote freelance travel and feature stories for newspapers until burning out by age 26. A six-week introduction to visual arts course he took in 1989 at the Boston Museum School inspired a love of painting as well as a new career. After three years of living and working in Spain, and showing his paintings there and in Portugal, Block returned to the D.C. area. Marriage, the birth of two children and a move to Silver Spring followed, and he continued to paint and exhibit “extensively,” and wrote drafts of his five now-published books. As for theater, Silver Spring Stage performed Block’s one-act “Frank Johnson” in 2007, and his first full-length “White Noise” was on stage at the District’s Fridge in 2012, and off-off-Broadway at Theater for the New City the following year. The stage, he said, is his particular passion “because I can bring all of my creative interests together in one place.” In addition to appealing to his interests in writing and philosophy, he noted, most of his plays have a multimedia element, including music and/or modern dance, as well as his paintings, which serve as part of the set. Productions and readings of several of his plays will take place in the next few months in New York City, and two Off-Broadway possibilities are in the works. Next up are a reading at the Ensemble Studio Theater, with a Broadway director and Broadway-seasoned actors, and a play in development with Off-Broadway’s Athena Theatre Company. Only the painting arena is “quiet just now,” Block said, except for a viewing of his huge painting, “Broken Berlin Wall,” during the American Institute of Contemporary German Studies’ Global Leadership Award Dinner on Dec. 15 in New York City. Everyone’s “quiet” is not like Tom Block’s.